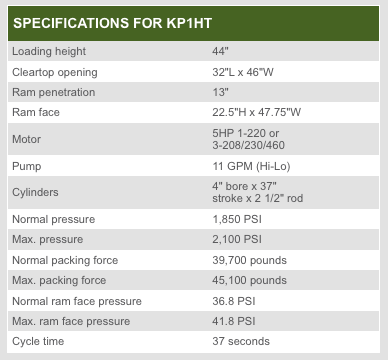 K-PAC’s KP2HT Self-Contained compactor is an excellent choice where vehicle maneuvering space is limited. Ideal for chute fed and dock fed applications. 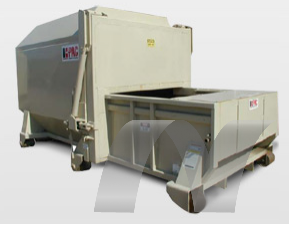 The innovative high-tail design allows the user to have the advantage of being able to feed it from a dock or from under a chute without having to pay their hauler extra to turn the compactor around. To assure clients of a liquid tight door, K-PAC borrowed from the science of the U.S. Navy and uses the same “closed cell neoprene” seal material as used on nuclear submarine doors. 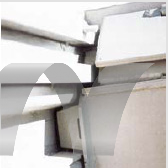 The superior seal material along with K-PAC’s unique channel and blade system deliver a door rated the best in the industry by knowledgeable users. It’s the little details that make K-PAC equipment the best in the industry. Heavy-Duty Dual Ratchet Latch System. This pulls the door tightly and evenly against the door seal while an innovative latching system features an adjustable stop to prevent over compression and damage to the seal. And for models without the splash pan, we have engineered in an extra set of wheels at the joint between the body and the packing head for a superior seal against leakage and flexing. In order to enhance the charge chamber’s floor life cast iron shoes requiring no lubrication run in a formed track on replaceable steel wear strips. In addition, with the use of four sets of pads on the side & the base of the shoes, ram chatter and maintenance is virtually eliminated. AR plate is also used as the floor.